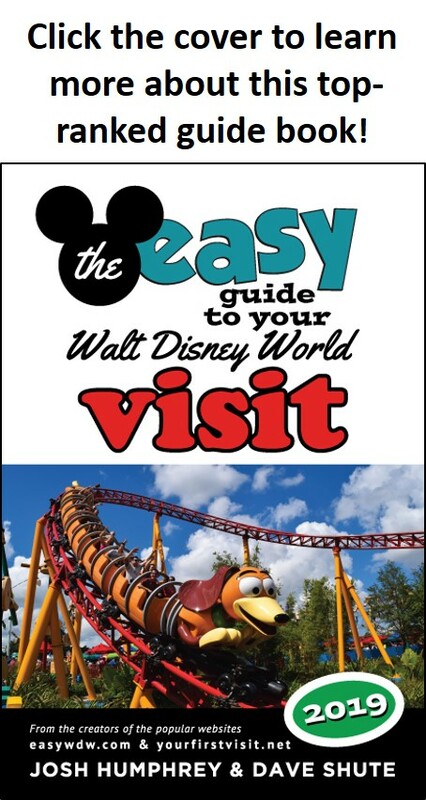 This page addresses where to stay at Walt Disney World for a subset of first time visitors: tightwads. Walt Disney World Resort hotels have standard prices that go up and down over the course of the year. Disney World also offers resort hotels at different price points, ranging from less than $100 to more than $300 per night. In addition, during one particular time of the year, not only are Walt Disney World prices lower, but often it offers a deal for free food. This for general thoughts on managing your Walt Disney World budget. Also, even during good economic times, Disney will make various deals available to the general public. These deals can be up to 45% off of seasonal list prices. These deals can be available almost any time of the year except for the very busiest times—you won’t find them at Christmas/New Years, Easter, or Thanksgiving. Also, in the busier times of the year, both fewer resorts, and fewer rooms within them, will be available for these deals. The good news for bargain hunters is that these deals tend to be most available during the same seasons that list prices are also at their lowest—so that the deals drive the prices to rock bottom. You can find many of these on Walt Disney World’s “Special Offers” page. There are lots of other sites on the web for Walt Disney World bargain hunters. On this site, pay attention to the ads—Disney often places ads for discounts at the top, right side, and bottom of the pages of this site. Also check the “News and Changes” section—if there’s a big deal discount, it will usually be in there. Be also sure to check MouseSavers.com. It typically has the best and most comprehensive listing of Walt Disney World discounts available. Besides Disney itself, you can sometimes find Walt Disney World resort hotel deals on the usual hotel websites—e.g. via Kayak.com—or as part of packages offered by airlines and such—e.g. Southwest Airlines. Be very careful with the results of internet hotel searches. Many of these hotels are great for returning visitors, but should be avoided by first-time visitors. The hotels that may show up on these searches that first time visitors should avoid include the Walt Disney World Swan, Walt Disney World Dolphin, and any hotel with an address on Hotel Plaza Boulevard. You can also find Walt Disney World resort deals packaged by airlines. More of these are available to you if you are willing to go through a connecting city, as this opens flights to Orlando for you from pretty much every airline that serves your local airport. Always check the websites of the airlines that serve your home (and nearby cities as well) for such deals. Also check with AAA and AARP if you are a member. Beyond this, if you are not satisfied with the deals you have been able to find on your own, consider working with a travel agent that specializes in Disney travel. They may be able to find you a great airline or other package deal. Hi Amanda! There are hotels “on site” for Epcot and the Magic Kingdom, two of the four parks at Walt Disney World (the other two are Hollywood Studios and Animal Kingdom), and separate on site hotels at Universal, which is a totally separate operation with two parks (Universal Studios and Islands of Adventure, where Hardy Potter is) miles away…but none that are convenient for both…so can you clarify a little for me what you are looking for? Hi Dave, my family of 3 is taking a trip April 18-25, 2014. We currently have a reservation at AS Sports, but are considering a significant upgrade to Wilderness Lodge with the hope that there will be a spring special (20 or 30% off) off the Deluxe resorts. Question is…what is the pattern of discounts around April each year?? Thank you! Was this even remotely helpful? Well then mosey on over to the home page, and like it on Facebook or pin it on Pinterest! Hi there! I really need your help! My huge family of 23 are taking a firste trip to Disney April 12-14. We need somewhere where we can all stay, maybe 3 rooms or 3 3 bedroom villas? We also want to go 1 day to Epcot. Can you help me with where to stay? Or what is best? Isabel, that’s one of the three or four most crowded and most expensive times of the year to go to Disney World…are you sure you want to go then? And you only want to go to Disney World’s Epcot? Or other Disney World parks as well–the Magic Kingdom, Animal Kingdom, Hollywood Studios? Nothing of course will fit you all, so you want to either rent some homes off site–cheapest, but not a great answer when its wildly crowded–or get several spaces on property. We have a family of 9 going possibly August 5-11, 2015. We don’t plan on staying together (in rooms) but want to be close to buses (mobility issues), have nice beds (hubby is 6’6″) but want to stay on the cheap side of things. Are there normally any deals for around this time? Would Pop Century be ok as far as beds are concerned? Kids are 11, 11, 12, and 7.